55 Spartans competed in five or ten mile races at the weekend! The Hatfield Five included the County Five Mile Championships for seniors (18 plus). The twenty one Spartans included eight new lifetime personal bests (PB); two season’s bests (SB); three best in 2018 (YB) and seven running their first five mile race. YUKO GORDON won the women (60 plus) category in 35 minutes 44 seconds and beat her PB by 1 minute 4 seconds. IRIS HORNSEY was second woman (70 plus) in 50:43 and MARK GOODWIN third man (60 plus) in 36:22. MARTIN BLACKBURN was running his first five mile race and was the fastest Spartan with 31:06 and 56th out of the 657 finishers. Spartan DUNCAN FLOUNDERS ran despite suffering from a cold this week. He said, “I almost pulled out at the last minute but it was my last race if the year so convinced myself to get my trainers on and join in.” He finished in a time of 35:23, beating his PB (personal best) by a whole two seconds so was glad he made the effort! LEE PICKERSGILL finished in a new PB of 38:22 almost a minute quicker than last year. CAROLE SHELDRICK was delighted with a new PB of 41:01, a massive reduction of 2 minutes 51 seconds. She says she’ll lose that second next time. After the “wheels came off” in last week’s St Neots Half Marathon JIM BROWN was happy to finish. He was determined to get round in under 40 minutes. After a good start with 7:57 and 7:53 miles he lost valuable seconds due to minor delays on a narrow section of the course and had nothing in hand at the end of mile four so the last mile hurt but was worth it for a year’s best time of 39 minutes 49 seconds. DANNY SCANLON said it was a great local race and he enjoyed it. He came in top 100 at 79th in 32:29. One second is enough for a PB and that’s exactly what KEN JUDE took off with his new best time of 40:26. ISABEL GREEN ran a five mile PB (by 29 seconds) with 36:06. She said she was helped by fantastic marshals including several Spartans who were helping on the day. SALLY PHILLIPS was another Spartan taking more than two minutes off her five mile PB. She improved by 2:21 to 48:09. MONICA SMITHSON ran her fastest five for eight years with 44:51. EDWARD HARPER 40:01; SOPH GEORGIOU 44:45; CLAIRE HYDE 44:25; SALLY McBRIDE 47:22; KAREN BROOM 47:24; HOLLY ARCHER 48:03 were running their first five mile race. SHARON CROWLEY ran a 2018 best of 52:41. Thirty Spartans enjoyed the Bass Belle ten mile race at Bassingbourn. KAREN ELLIS said it was a cold start but a great run with beautiful views. She beat her personal best by 21 seconds to finish in 1:21:41. MADDIE PRITCHARD was the fastest female from Fairlands with 1:20:47. JO BOWDERY ran with Rufus the dog and finished in 1:23:06. GRANT RAMSAY was 12th out of the 369 finishers in 1:03:43. A “So Happy” MEGAN TAYLOR got a PB by nearly 14mins. She improved by 13:38 to 1:29:27. SAM SIMMONS took a 8 minutes 4 seconds chunk off his PB to 1:26:26 while ROWENA RUTLEDGE 15:31 to 1:41:46. TIM SABAN result from the Bass Belle was 1:13:43 like last week I used this race as part of a long training run, clocking 5 miles before the race. Which gave me a chance to warm up somewhat on a chilly morning. First time for me doing this race. Using some of the course of the Bassingbourn half in reverse. CAROLINE CROFT says it was still not Mr. Whippy weather but finished in 1:37:19. (Times for all thirty Spartans can be found at the end of this release). 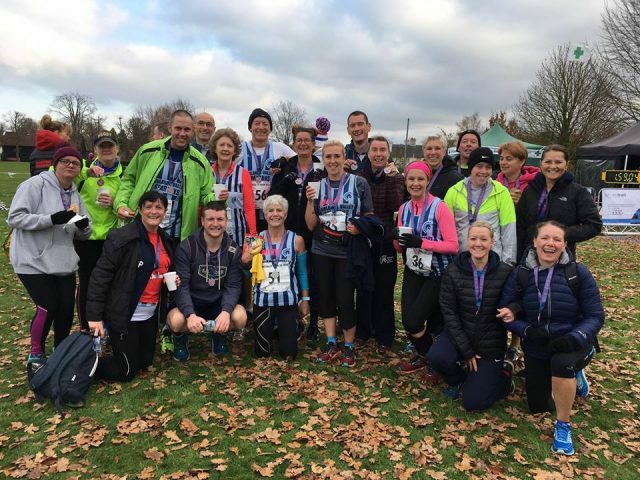 The 54th Wolverton (Willen) 5 mile road race was held on Sunday 25 November 2018, starting at 11am. The race moved from its traditional Saturday afternoon to Sunday morning creating a clash with other popular events and reducing the number of runners. However four Spartans made the trip to Milton Keynes. STUART HAYCROFT came very close to a 10mph average with 30 minutes 4 seconds and 49th out of the 244 finishers. Stuart Haycroft ran the Wolverton 5 mile in a personal best time of 30:04 completing the royal flush of a PB in all eight club championship distances during 2018. DAVID BOWKER was 91st in 33:18. After a late start PAUL HOLGATE finished 229th in a net time of 46 minutes 23 seconds and ROGER BIGGS was 237th in 53:17. This week’s parkruns saw Spartans running in nine different locations in the UK and further afield in Germany. Jonathan Parr was first overall at Stratford upon Avon in 17:33 in his first run there. In Berlin Darryl Stevens ran the Hasenheide Parkrun in 36:23. Danny Sutton celebrated his 200th Parkrun running 24:01 in a Torbay. Verity was a few seconds behind in 24:03. In Stevenage Stuart Porter was fourth overall in 19:30. Michelle Reeves was first lady in 21:07 and Kerstin Weiner fourth lady in 24:25. There were PBs for John Holmes (20:50) and David Ackery (28:01). Barry King ran a new PB at off road Wimpole Hall (25:38). James McSweeney ran a new PB at Brandon Park near Thetford of 23:23. John Nelms ran in Great Denham in 21:41. Dave Smith ran the relatively new Coldhams Common Parkrun in Cambridge in 27:30. Full details for all parkrunners below. A total of 304 runners took part.